Nothing suggests a whimsical sense of style quite like printed dresses. Whether it’s timeless polka dots or something considerably more adventurous, printed dresses can make your outfit wonderfully playful. We may be inclined to think of them as a something resigned just for daytime. 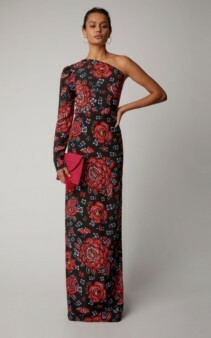 This edit, however, demonstrates just how elegant and charming printed evening dresses are too. 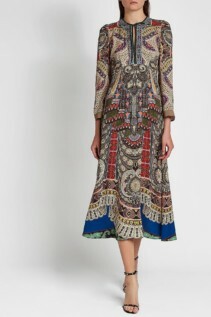 There are few bolder ways to dress than in full length printed dresses. Depending on the pattern you choose, your outfit can instantly become the most intriguing sight in the room. The California Dreaming silk georgette dress by Johanna Ortiz is a prime example of such an outfit choice. 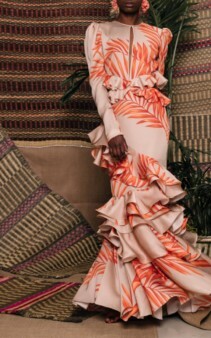 Camel and tangerine shades cover this sensational gown in its entirety. It stylishly incorporates a keyhole cutout on the chest and delicately puffed, full-length sleeves. The full skirt is comprised of many ruffled tiers that embrace the hips and legs. Meanwhile, a cinched waist with ruffle detailing ensures this dress is still entirely flattering to the figure. 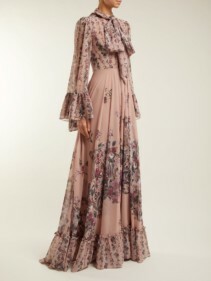 For something more tranquil or perhaps even bohemian, opt for the Buena Vista silk kimono dress, also by Johanna Ortiz. The delicate, printed silk slips onto the body draping seamlessly from head to toe. 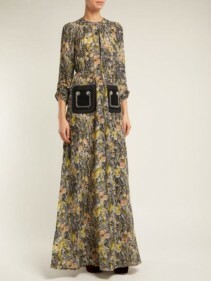 The included belt highlights your waist so you can choose to wear the dress alone or as a stylish duster. Printed dresses are an ideal way to take your look from day to evening with just a simple shoe change. An eye-catching print helpfully eradicates the need for lots of accessories. Simply shake out your hair and add heels for the evening ahead. The Lakeside mini black dress by Yumi Kim is perfect for such an occasion. 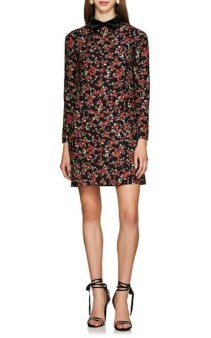 This dress is proof that floral mini dresses aren’t just for summer. Owing to a black background the brighter printed flowers appear fittingly warm and autumnal. The mock neck is ideal for the chillier weather and the tiered skirt adds an additional, playful touch. This versatile dress can be styled with boots for a chic day look or with heels for the evening. 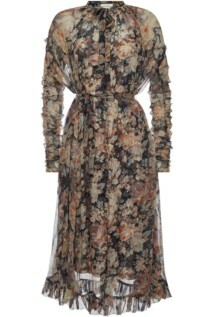 The velvet trimmed shift dress by Valentino is another beautifully adaptable option for autumn. Long sleeves perfectly offset the short hemline whilst the black velvet collar adds a chic finish to this adorable dress.